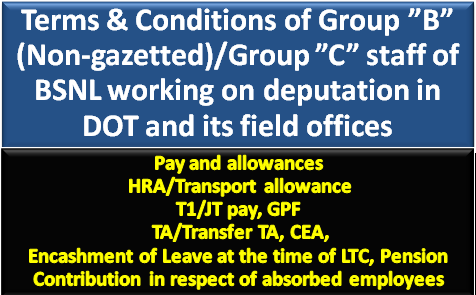 Terms & Conditions of Group ”B” (Non-gazetted)/Group ”C” staff of BSNL working on deputation in DOT and its field offices. The admissibility of various allowances to BSNL staff who are on deputation in DOT and its field offices has been under consideration in View of the instructions in DOT OM dated 10.01.2012 wherein it was prescribed that the engagement of BSNL Staff in field offices of DOT is to be brought under the purview of standard terms of deputation under the provisions of DoP&T OM No.6/8/2009-Estt. (Pay II) dated 17.06.2010. The field offices of DoT were instructed therein to regularize the existing arrangement of BSNL staff under the provisions of para 7.6 of the above cited OM dated 17.06.2010 and allowances as are not, admissible to regular employees of corresponding status in the borrowing department/organization shall not be admissible to the officers/officials on deputation/ foreign service, even if they are admissible in the parent department/organization. The conditions in respect of tenure of deputation/foreign. service, leave rules and premature reversion will also be regulated in accordance with DoP&T O. M. dated 17/06/ 2010. 2(a). The pay fixation and admissibility of various allowanCes / facilities expressly as provided in the DoP&T OM dated 17.06.2010 will be regulated accordingly as provided in the OM. 2(b). The ad~hoc CDA Bonus as declared by CO] during the deputation period, may be paid to the BSNL employees on deputation. to DoT as they will not be eligible to get BSNL/PLI, if any, declared by BSNL for its employees. 3. (i) HRA/Transport allowance: The employee on deputation will draw these allowances w.r.t the option exercised for fixation. of pay. If the option is exercised for fixation of pay in the Government, the employee concerned will be governed by the rules of Col for drawl of HRA/Transport allowance. If the option is for drawing the scale of pay of the parent organization, the same will be regulated as per the rates admissible to employees of BSNL at the station. BSNL specific allowances viz. Professional Upgradation, furnishing allowance, Outdoor Medical facilities will not be given to BSNL employees on deputation to DOT. (ii) T1/JT pay: The joining time, where applicable, will be allowed under CCS (IT) Rules, 1979. Joining time pay will be the pay drawn iinmediately before the relinquishment of the charge of the post. The IT pay while proceeding and repatriation will be drawn/borne by the borrowing Department. (iii) TA/Transfer TA: Tour TA will be regulated w.r.t. rules applicable to Central Govt. employees, at par with the corresponding grade of employees. Transfer TA will be borne by the Govt, for both transfer on deputation and repatriation on completion of deputation, as admissible to corresponding grades of employees. (iv)CEA: This will be regulated in accordance with the rules in the GOI and the cost will be borne by the Govt, for the corresponding years/blocks as applicable to the period of deputation. In the event of the official on deputation not availing this facility during his stay on deputation there shall not be any reimbursement/adjustment on accrual basis. (v) Encashment of Leave at the time of LTC: Presently, no facility exists in BSNL. As such, it will not be payable. In case of subsequent restoratiOn of LTC facilities by BSNL, matter will be relooked into. 4. Pension Contribution in respect of absorbed employees is normally payable to GOI by BSNL on account of pension liability under rule 37 A of CCS (Pension) ”rules, 1972. Pension contribution in respect of BSNL employees on deputation to DoT shall be exempted from payment to GO] during the period of deputation of the employee in Govt. A remark to this effect will be recorded in the service record of the official during the period of deputation. In cases of employees covered under EPFO Scheme, employer's contribution shall continue to be paid by BSN L to EPFO. However, DoT shall reimburse to BSN L on a quarterly basis. 5. Leave salary Contribution will be borne by the Go1 as per extant rules in FRSR Part I. 6. The deduction of subscription/recovery towards GPF made from the salary of these employees will be accounted in DoT in respect of the employees who are subscribers to GPF. 7. The employees of BSNL while on deputation with DoT will be entitled to CGHS facility in accordance with the rules of borrowing organization i.e. as applicable to staff of DDT Units. The CGHS card is required to be surrendered at the time of repatriation. 8. The family planning allowances will be regulated as per GOI MoF OM No. 07(39) EIII/79 dated 19th July 1980 under Rule FR 27. The Compulsory Insurance Scheme and Standard License Fees will be regulated as per option of employees. 9. In case of any dispute, in r/o interpretations of any of the clauses of this understanding, the decision Of Secretary, DoT will be final and binding.